Around the world, researchers are finding that robots can do many tasks once done only by humans. What’s the solution to the problem of an aging population in a society with a decreasing amount of (human) caregivers? Looking at the direction that research is going, the answer is robots. Researchers in Japan are leading the way, where 20 percent of the population is over 65. By 2025, experts predict a shortage of 1 million caregivers for the country. It’s not surprising that Japan, which has often led the world in technological development, is creating “carebots” that could take the place of caregivers in several ways. In fact, one-third of the Japanese government's budget is allocated to developing carebots. One example of ongoing research is Honda's Asimo, a humanoid robot that can bring food to someone or turn off the lights. Another is the Resyone robotic device, which converts from a bed to an electric wheelchair, eliminating the need for a strong caregiver who can lift someone in and out of bed. A similar device helps transfer seniors from the bed to a wheelchair. In Europe, which is also seeing a graying population and a drop in birthrates, the European Commission is investing tens of millions of euros annually in technology to help older adults and strengthen the region’s robotics industry. The research project Robot-Era recently concluded the world’s largest real-life trial of robot aides for older adults. 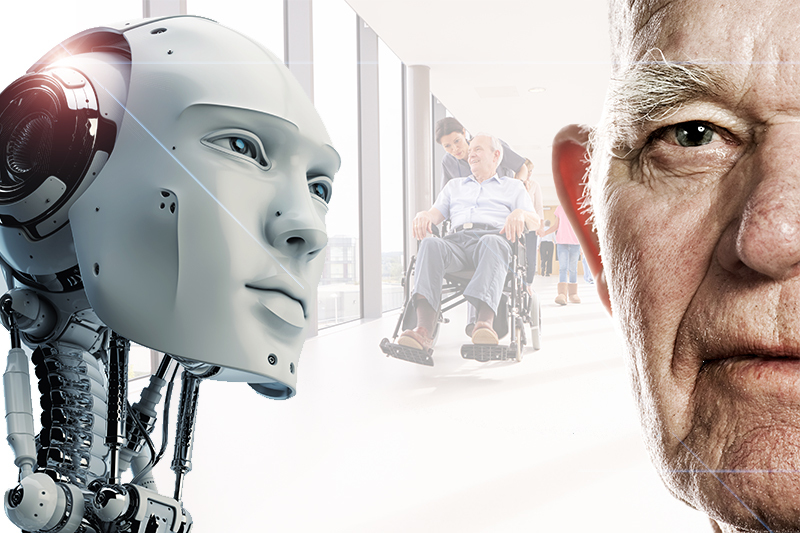 During the four-year project, about 160 seniors in Italy and Sweden tested the robots. A promotional video shows an older man enjoying breakfast at home while his humanoid robot stands nearby in the kitchen. When the man turns to the robot, it comes over to him, and the man removes a computer tablet from its front, on which he punches his grocery list. The robot then makes its way to the nearby grocery store, taking the elevator down to the street, walking down the sidewalk and several blocks to the grocery store, where a friendly clerk has the order ready to be delivered back to the man. Other test robots can do a whole host of daily tasks: accompanying people to a nursing home’s dining room and reminding them when to take their medications; retaining important information such as phone number or names, while tracking the senior’s progress or memory loss over time; reminding people of meetings; keeping track of shopping lists and playing music. These robots are able to speak but can also communicate through a touch screen that features simple icons for things like medication. In the United States, 13 percent of the population was 65 or older in 2015, but that percentage is expected to nearly double by 2050, according to the Pew Research Center. IBM is working on a robot with sensors that detect changes in the homes of seniors who live alone. For example, the sensors can identify when the stove's burners are on or when someone has fallen. A camera on the robot can read facial expressions to see if the person is having a stroke or heart attack, for example. Experts see much promise in getting seniors to use virtual reality. An older adult can take a virtual tour of their hometowns, workplaces they remember fondly or beaches they loved. This not only stimulates memories but also brings a sense of connection to the world, especially for those who are homebound. In a nursing home in New York, residents with dementia and Alzheimer’s, cuddle and lovingly talk to furry robotic cats. The interaction appears to ease residents’ agitation and anxiety. While nursing homes have long used pet therapy, a robot cat is more reliable than a real one, which can scratch or wander off. A staff member said the robotic cats give residents a chance to actively take care of something, which makes them feel good, instead of passively receiving care. Researchers are also testing a talking parrot to interact with Alzheimer’s patients. “Polly” repeats in a high-pitched parrot voice whatever she hears—twice—mimicking the actions of a real parrot. Initial reports from families of Alzheimer patients are encouraging. Using robotic animals to interact with people who have dementia has proved successful in Japan for more than a decade, where baby seal robots are popular. Research has shown reduced levels of the stress hormone cortisol in the older adults who pet the baby seal, which responds with body and eye movements. Although proponents tout that robots can have limited conversations with seniors, which can help keep aging minds sharp and ward off loneliness, experts in the field of aging don’t see robots as a replacement for human companionship. Susan Madlung, a gerontologist at Vancouver Coastal Health (quoted in Aging Care) believes robot care would only compound seniors’ social isolation: “Although robots might seem like a good response to the growing need for caregivers, I could see this as being quite detrimental to the emotional and psychosocial well-being of anyone, not just seniors. Humans need humans." “Therapy Cats for Dementia Patients, Batteries Included,” Dec. 15, 2016, New York Times. “Europe Bets on Robots to Help Care for Seniors” March 17, 2016, Bloomberg News. “IBM is working on a robot that takes care of elderly people who live alone,” Dec. 28, 2016, Business Insider. “Seniors Welcome New, Battery-Powered Friends,” Jan. 20, 2017 , New York Times. “A role for robots in caring for the elderly,” May 16, 2016, Cisco Newsroom. “I, Caregiver: Do Robots Have a Place in Elder Care?,” Aging Care.